There’s no reason to deny it, Elvis is the most photographed man in the history! So, please forgive us when we do not know the exact date of some, but pics of Elvis are so great to see and treasure that we do not think there is a rason why that should stop us from sharing them with you! This one was made in 1973, that’s for sure. But the day is either June 25th or 26th , during his June tour. He started that one on June 20th in Mobile Alabama, the tour ended in Atlanta on July 3rd. On June 25th & 26th he performed in the Civic Center Arena, Pittsburgh, Pennsylvania. We can see Elvis in front of police officers who, without a doubt took care of his (and the audience) safety before, during & after the shows there. 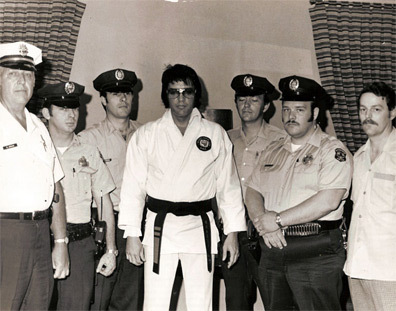 It is a proud Elvis we see standing here, he is wearing his karate outfit, (his all time favourite sport) and the police force is something he held close to his heart. We all know he was a collector of police badges, so it could very well be that there was a new piece in his collection that night! If you want to contribute a picture (minimum width 400 pixels), just send it to us, please include background information and the reason why you picked it. Perhaps this was taken at a karate studio. That would explain why Presley was kitted in his full karate outfit for what I am assuming is a karate demo.